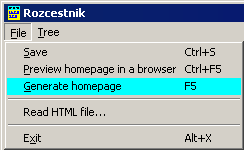 Rozcestnik is a program for managing a browser initial page (Home page). The program helps managing a collection of links and forms that are to be present in the home page. In addition to generating the file, Rozcestnik can also read back the HTML file it generated and make modifications. This comes in handy you already have such a homepage made by hand. Files needed by Rozcestnik are placed in the Documents folder for the user. The HTML output is named Rozcestnik.html, so you should point your web browser to that file as the homepage. The project data itself is stored in a Rozcestnik.rozc file. If the project data file doesn't exist upon Rozcestnik startup, Rozcestnik will try to parse Rozcestnik.html file. If that fails, a default project will be created. 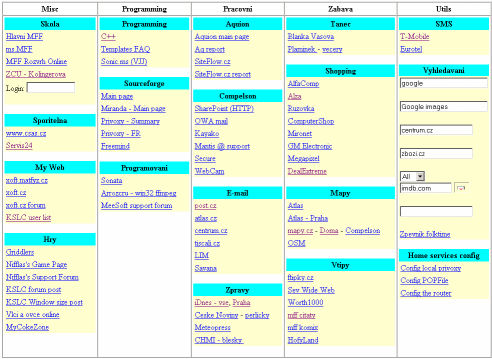 The main window shows a hierarchy of columns, groups and in them, individual items. The tree on the left side works as a selector for these items. Select any tree node to display and edit its properties in the rest of the window. Forms have a bit more complicated editor, since more data is needed to construct them. Most of the items are direct representations of HTML elements used to create a form. Name is for displaying purposes only. URL points to the action URL of the form. 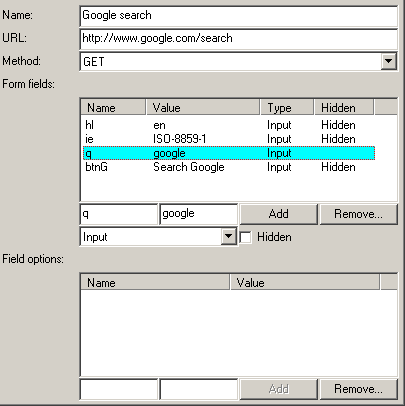 Method specifies the HTTP method used for sending form data. Form fields can be either input or select. Buttons as such are not supported, since those would be useless in a webform. If required by the target webpage, button values can be faked using an Input field. For Select fields options can be added into the Field options list. For those, Name is the string displayed in the browser and Value is the data actually sent to the server. 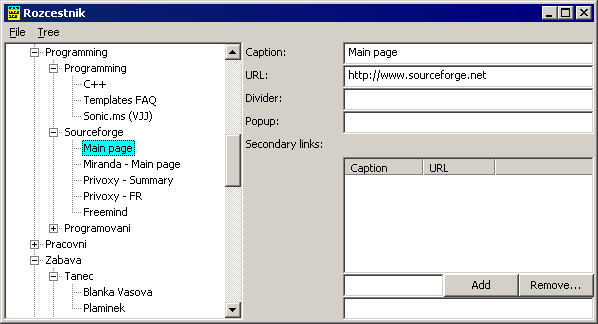 Use the menu to generate the final webpage or preview the page before final generation. Integration into browser - "Add current page", "Add a form from current page" etc.